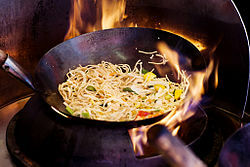 A wok is a Chinese pan used for cooking. It has a round bottom. The most common use for the wok is stir frying, though it can also be used for deep frying, smoking, braising, roasting, grilling, and steaming. This page was last changed on 11 July 2018, at 16:29.